After a very long day yesterday (although I was surprised and pleased to find that there were two girls even slower than I was, hooray!) I had a nice long sleep-in at Iris Burn Hut this morning. Then, plastering my blisters, I set off on what would be a day of comparative ease – six hours of bushwalking through to Manapouri Lake and Moturau Hut. For once, my legs agreed with DOC’s estimate. Going along the flat, through lovely beech forest, I’m fairly speedy; it’s only on the big hill stretches (and both up and down have their own special little tortures) that I go all tortoise-like. I didn’t take many good photos today, though. The weather forecast had come in at 8.30am, and it was continuous showers that would turn to full-bore rain early-to-mid afternoon. So I threw on my pack (feeling lighter as the days go by, all the food being eaten as I go and I’m just not that hungry anymore anyway) and try and make Moturau before the storm hits. Which I do, by about ten minutes. Good timing, eh? At least the rain put paid to the sandflies, bloodthirsty little buggers. 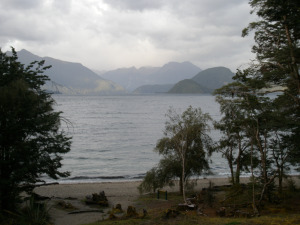 Moturau is on the edge of Lake Manapouri, which is apparently quite nice to swim in, though I was too lazy and comfortable inside to go and get all wet.